Písanky (decorated eggs), are a symbol of spring and new life. It is only natural to have the egg represent the New Birth Life that is ours in the Risen Christ. Eggs are a sign of hope and resurrection. Jesus comes forth from the tomb as the chick breaks through shell at birth. It is fitting that these eggs that are blessed should be brightly decorated. Písanky comes from the verb, pisať, which means to write. 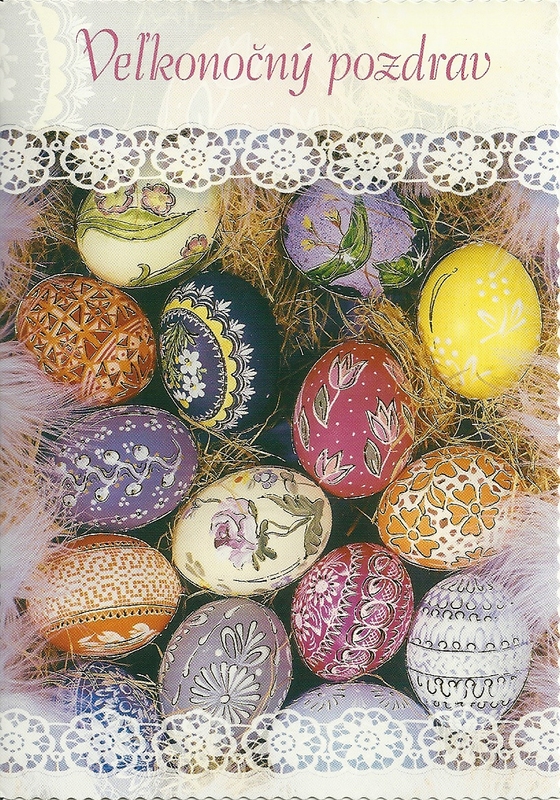 Some of the most beautiful Easter eggs in the world originated in the Slavic nations. The eggs were decorated using a special stylus dipped in melted beeswax. The pattern was put on the clean surface of an egg with wax and then the egg was dipped into a dye. The places covered with wax were not colored by the dye. The Eastern European women took great pride in the originality of their eggs; the eggs were sometimes decorated in secrecy. They were seen in public for the first time when the Easter Basket was blessed. The Art goes back well before the beginnings of Christianity. Though the meanings of the design vary from place to place. Certain motifs are usually used in particular areas. Different colors have special significance. Green means money; purple, power; orange, attraction; black, remembrance; blue, health; brown, happiness; white, purity; red, love; pink, success; and yellow, spirituality. Some of the designs used were a rose or floral pattern symbolizing encouragement of fondness and love; hens and roosters, fertility and the fulfillment of wishes; fish, ancient symbol of Christ; reindeer or horse, wealth and prosperity; little baskets or any trio signifies Holy Trinity or fire, air & water; and the pine tree is eternal youth and health. Important symbols of our Easter eggs will add rich significance to this very popular food. Písanky are never made from cooked eggs. Either blown or uncooked eggs are used. It is best to use blown eggs, if you want to keep them for a long time. Another way to dye eggs was to cook an egg together with onionskins and the stems from winter crops or other plants. Even today, women and girls usually prepare decorated eggs. Though most people just purchase the dyes. In southern areas of central Slovakia patterns are scratched into the egg’s painted surface. These are called Kraslice meaning “beauties”. Painting patterns with various colors directly on eggs is also common. Decorations are sometimes made by the lengthy process of gluing cut straws or plant pulp on to a clean egg. Such decorated eggs are given to the boys who come to douse girls with water on Easter Monday.